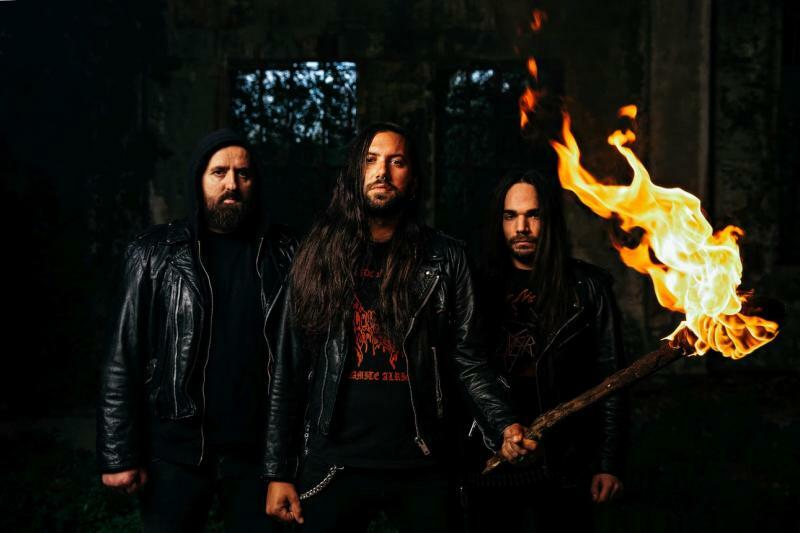 HIEROPHANT: Italian deathmongers return with “Spawned Abortions”! After having obliterated Germany’s Party.San Open Air and several other European festivals, HIEROPHANT is back with “Spawned Abortions”, a new EP released via Unholy Anarchy Records. With their first effort since the acclaimed “Mass Grave” (Season Of Mist, 2016), the Italian band exhume the brutally-primal sledge hammer of old school death metal and ravage it with the violent, frantic edge of grind and black metal to sonically smack the heck out of everything in their path. The songs comprising the EP – the title track and a powerful cover version of BOLT THROWER’s immortal classic “Realm Of Chaos” – reveal HIEROPHANT’s strong connection to their death metal influences clearer than ever, all while opening the gates to a profound and disturbing musical voyage. “This new song summarizes this band and its total evolution since ‘Mass Grave’ came out”, Lorenzo Gulminelli (vocals/guitar) says when interviewed by CVLT NATION. “There is no room for happiness but only for chaos, for the grim, for an unconditional and absolute disgust towards the enormous surge of crud we are overwhelmed with every day”. “It is great to hear that the music that we created nearly 30 years ago is still kept alive and inspires other musicians from a younger generation”, Karl Willetts (BOLT THROWER/MEMORIAM) says about HIEROPHANT’s cover. “We are proud of what we achieved with Bolt Thrower throughout our career, and ‘Realm of Chaos’ was a defining moment for the band so many years ago — keep the death metal flag flying high!”. “They are one of the best death metal bands of all time”, Lorenzo explains, “and this is the reason why we chose them. Hail to death!”. Darkness comes crushing down like an avalanche of despair, misery, and pain. While an undercurrent of harsh brutality is tangible within each note, there is also a black void clawing at sanity and trying to drag all emotion into the lurking abyss. HIEROPHANT were conceived in the classic Adriatic city of Ravenna in the Emilia-Romagna in 2010. The band quickly left a mark as one of the leading exponents of extreme Italian music. A first self-titled full-length was released in the same year as their founding and the band started to constantly play all over Europe. HIEROPHANT were also picked up on the other side of the pond. Following the EP “Son of the Carcinoma” (2013), their sophomore album “Great Mother: Holy Monster” (2013) was also released in North America. Several tours and festival performances later, the Italians showed no sign of relenting. Their third full-length “Peste” (2014) rather increased the band’s massive sonic impact, amalgamating sludge, black and death metal as well as a manifest punk attitude. With “Mass Grave”, released via Season Of Mist in 2016, the band managed to take their extreme brand of hard music a step further.